The best way to get a job is to fight for it with your confidence, your experience, your professionalism and your perseverance. Having worked in HR for three years, I’ve conducted various in-person and over the phone interviews with people from diverse backgrounds and ethnic groups. I’m thankful that I am now in a position to offer honest feedback without being restricted to the bureaucracy in Corporate America. Although nervousness is inevitable, the best way to cure it is to have confidence in yourself. When you are walking into an interview with full knowledge of the position you’re interviewing for, full knowledge of how your skills and work history correlate with the position, and thorough knowledge of the company and where you foresee it going, nervousness will quickly become a non-factor. The moment you receive the phone call inviting you to an interview, you should first read over the job description and read over your resume` (so that you’ll know what experience to draw from when you’re asked a question), then do a few minutes of research online to see how the company leads in your respective industry. General knowledge of the company is well also; however, don’t spend too much time learning everything there is to know about the company. For example, if you’re interviewing with ABC Company as a Sales Manager, you don’t necessarily need to know the company won an award for having the best cafeteria for its employees- unless your job is to sell the cafeteria internally and/or externally. Have you ever held a conversation with someone who looked down at the floor the entire time you talked to them? How did it make you feel? Did you walk away from the conversation knowing they understood what you were saying? Lack of eye contact makes a conversation odd. It also gives off very negative impressions. Look the interviewer in the eyes and glance off occasionally as you speak. Oftentimes we can become too comfortable during an interview and slip into our “post-work” mode. 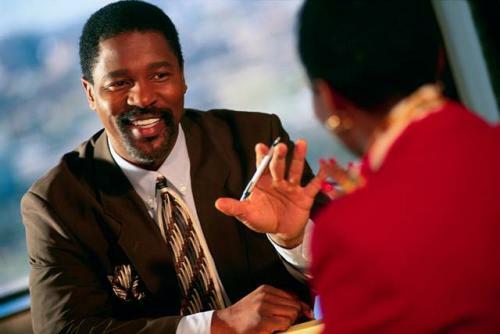 No matter how cool or friendly your interviewer is, keep in mind you’re a professional and you’re seeking employment. You can still exude your own personality, but refrain from using slang words/phrases such as; “real talk”, “forreal”, “keep it real”, etc. This mistake can cost you major opportunities because it shows you’re not an effective listener. I’ve run into situations when candidates didn’t know the meaning of a word and instead of asking me to clarify, they’d answer the portion of the question they are the most familiar with and completely abandon the other portion of the question. Again, I’m not discouraging anyone from exuding their own personality. By all means, be your (professional) self- especially if your role is one that requires you to interact with customers. Having a sense of humor is great, but it can also hinder you if you don’t filter it and limit it. Everyone may not find your jokes funny, so it’s important that you understand when jesting is needed and when it’s not. I’ve had a plethora of people give me their entire life story as to why they deserve the job more than someone else. I’ve had people tell me about their starving children, death within the family that has left them poor, illness that has left them jobless, etc. All of the stories are heartwarming, but none of them got them a job. Everyone has a pity party. Some pity parties are sadder than others, but they’re still pity parties nonetheless. The best way to get a job is to fight for it with your confidence, your experience, your professionalism and your perseverance. This article was first published on Your Black Bloggers.